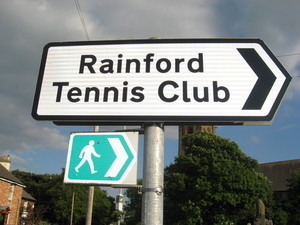 Rainford Tennis Club today unveiled their new road sign on Church Road telling people how to get to the venue. The sign, which was funded by a grant from St Helens & District Sports Council, points in the direction of the Club between All Saints Parish Church and the Golden Lion. “Our new road sign will raise the profile of the Club within the local community and make more people aware that we are here” said John Case, Secretary of Rainford Tennis Club.